Vicci Moore and Adamo Ciarallo are one of Europe’s most sought after blues teaching couples. From Valencia, to London, New York, Paris, and Kazan they travel the world to perform and teach Blues dance. They are two of the first European Blues teachers to be flown to the USA to teach. Adamo and Vicci have an incredible chemistry on the dance floor, bringing intensity, elegance and musicality to the dance. Their passion for blues is evident in their inspiring classes, giving dynamic and energetic lessons with a focus on creativity, developing a relationship with the music, and encouraging dancers to find their own blues voice. Both trained teachers, Vicci and Adamo love to create new and intuitive ways to communicate technical concepts to their students. They believe your body is a musical instrument and your dancing is the music you play, and will help you to discover the way your body moves in a whole new light. By watching them dance, or joining their classes you will learn to really ‘feel’ the Blues! Nick Shirbini and Ilaria Parisi are a cool London based blues dance duo. They love the way that blues celebrates human nature and is able to bring people together by giving them a medium to express their true selves. Ilaria is a caring teacher who encourages personal expression by not only explaining fundamental techniques to her students, but also providing the tools to let people connect to different partners and forms of blues music. Nick is a school teacher by day and dance teacher by night. He loves finding out exactly how things work (hence the science teaching) which means he is perfectly poised to break down techniques and moves in a simple and logical manner. In London Nick and Ilaria are ambassadors of the blues community; teaching weekly and performing front and centre with The Down and Outs troupe. Internationally they started their teaching journey in 2014 for the special occasion of Milan’s first blues dancing workshop. Since then they have been part of teaching teams all over Europe from St. Petersburg to Valencia. They are delighted to come to Amsterdam and are excited to meet a new vibrant and enthusiastic scene! Ally has enjoyed teaching Blues dance since 2007, though she discovered partner dancing first in 2004 when she fell in love with Lindy Hop. Since then she’s practiced several other dance and movement studies including: West Coast Swing, Balboa, Salsa, Tango, Contemporary dance, Hip Hop, and the Alexander Technique. All of these movement practices together have informed the movement knowledge and material that she brings to teaching Blues. She believes that curiosity, fascination and silliness are the bedrock of an effective (and enjoyable) learning environment, and she always seeks to keep her students engaged and laughing! You can learn more about her teaching and more at www.allydances.com. Lotte Dijkstra & Richard van Os are playing a home match. 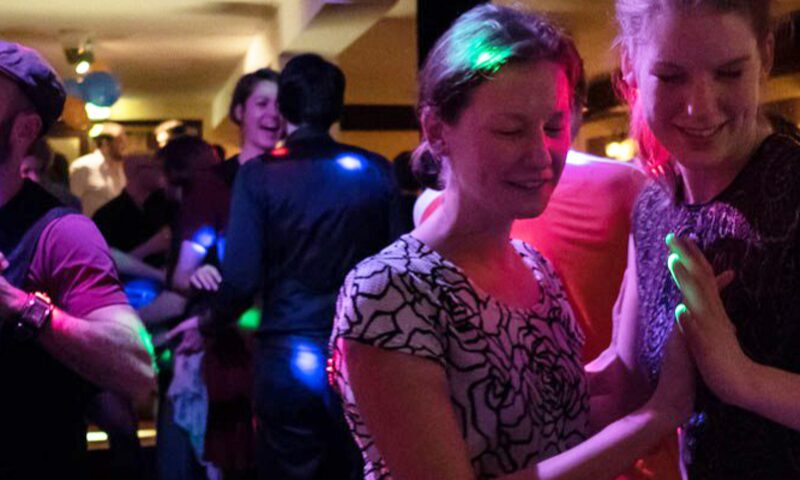 They are event organizers, scene builders and experienced teachers in Amsterdam, specialized in beginner classes. After many years of competing in the Ballroom and Latin-American dance world, Richard made his switch to swing dancing thru Boogie Woogie and Balboa. After watching Blues dancers on the traditional Slow Drag Night on his first international dance camp in 2011, he knew: this was going to be his dance!! After taken many classes and workshops abroad he started sharing his passion by teaching Blues to beginners and organizing Blues dance events in Amsterdam. Like Richard, Lotte discovered Blues Dancing at the Herräng Dance Camp in Sweden, she is hooked ever since. She has followed several national and international workshops and tries to attend any Blues social there is. Apart from dancing Blues she teaches Lindy Hop and Solo Jazz in Leiden and has been dancing ballet ever since she was little. Lotte and Richard will teach the first part of the beginners crash course on Friday night.